I am always inspired when I read a book by a creative artist. For example: Twyla Tharp’s book THE CREATIVE HABIT Learn It and Use It For Life is not just for dancers and choreographers. Every chapter will boost creativity in whatever your field. When I read these books, I always find something I can apply to my collage studio practice or apply when I design projects for collage workshops. Her chapter titled “Scratching” talks about how to get ideas and how to explode ideas. She says you can scratch in the footsteps of mentors and heroes, but must not copy or your work is derivative. Try to interpret the idea into a new idea and “scratch” in unexpected places to get a new slant on the expected. She says: link A to B to C to come up with “H.” She adds: scratching is the ability to identify A, and then get to B and C. So – don’t stop with one idea. I love class projects that explore collage with unique media, or explore images in collage based on other media. The image above is titled “Cucaracha” (1948). 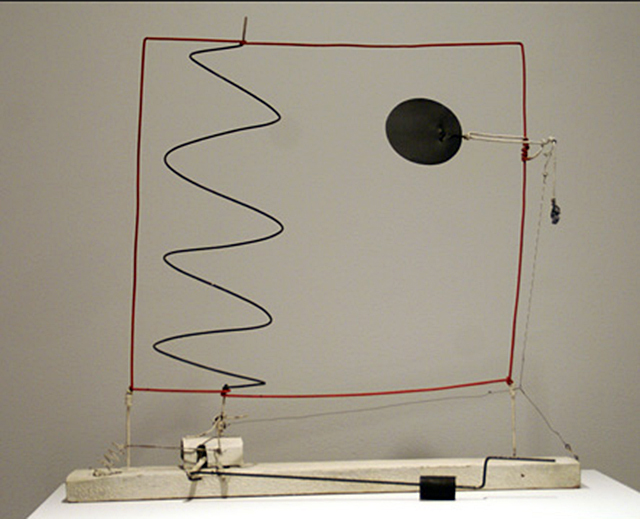 It’s painted sheet metal and wire, 17” wide, private collection, by Alexander Calder (American 1898-1976). He is famous for his mobiles and stabiles – metal sculptures that move in space. His work is about movement and change. 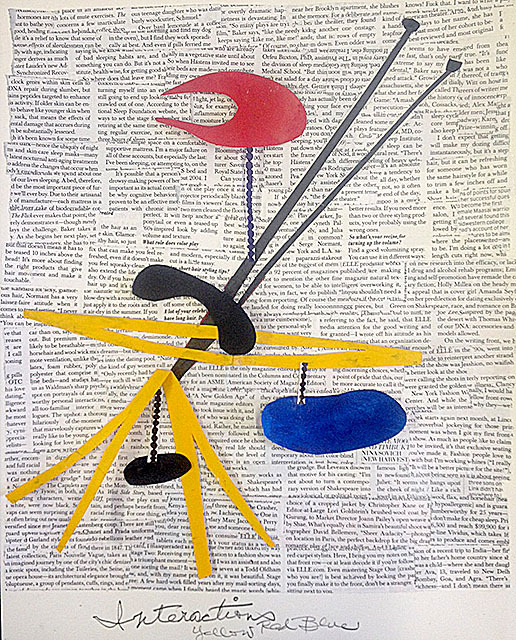 Very often his metal sculpture is painted in primary colors – red, blue and yellow. Notice how the mobile parts hang together from tiny chains. Notice how the sculpture casts a shadow as it stands on the ground. 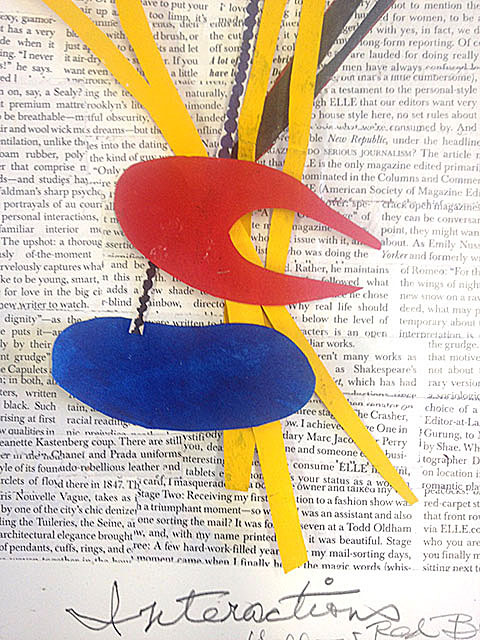 I asked students to make collage inspired by Alexander Calder’s mobile Cucaracha – a 3D metal sculpture interpreted as 2D paper collage. 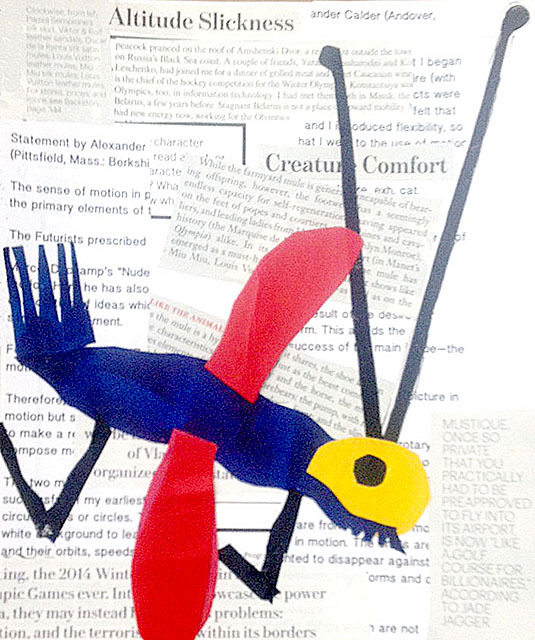 I asked the class to juxtapose print text with cut and pasted papers – one collage on top of another collage – to create a dialogue between the parts and show movement. Black and white magazine text would be the bottom collage layer. Cut and pasted red, blue, yellow and black papers would be the 2nd layer on top of the black and white text. 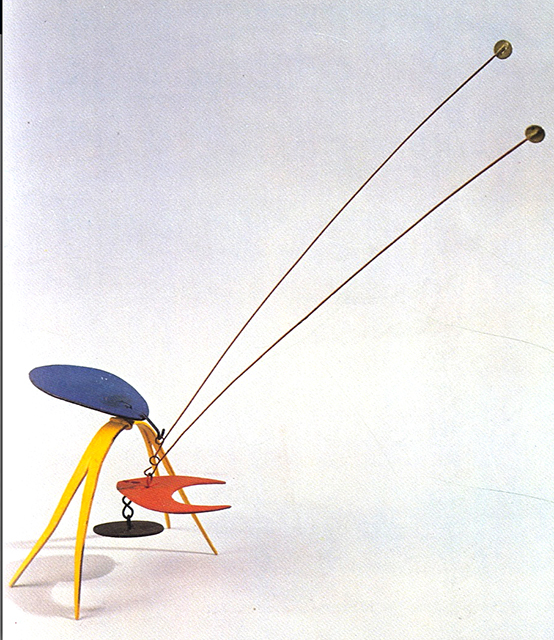 I found the Cucaracha image in the book CALDER CREATURES Great and Small, published by E.P. Dutton, Inc., NY in association with the Hudson River Museum and the Whitney Museum of American Art. The 2 images (above and below) show 2 different views of the same sample collage I created for the class. 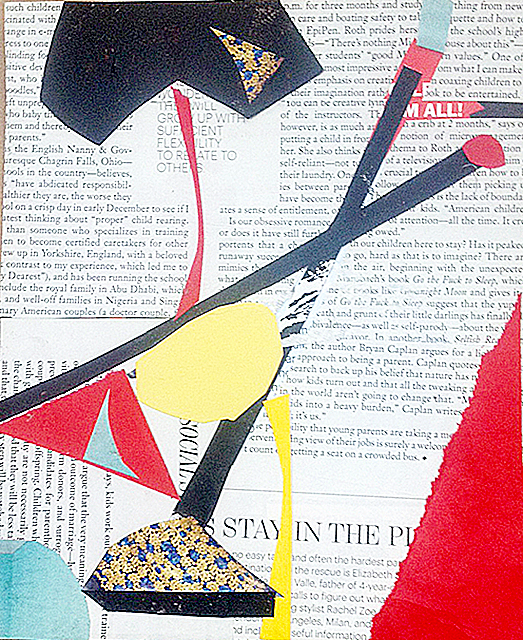 I deliberately cut shapes that looked like the 3D shapes – to show students how collage can look like sculpture. The top image is a close-up view and shows unglued yellow and black paper and blue and red round shapes overlapping in the middle of the page. The image below shows the same unglued shapes in another configuration on top of the text collage. When I move the papers, the design changed. I moved papers several times. I wanted to show the class how the image changed each time the papers moved. Calder’s art is all about movement and change. Collage is also about movement and change. And if you don’t like the collage, you can remove the paper and start again. Step 1: Make a collage with magazine text. Cut and paste magazine text to create a design. It’s black and white, can be clean and crisp, and creates a graphic pattern with letters. It looks easy but it took almost 1 ½ hours for students to create a collage with just text. I asked students to glue a long, thin strip of black paper diagonally across the page before they started to glue text. I told them it was important to have the text strips meet the black paper “antenna” and leave a tiny space between the edges. Notice I created a pattern with text. Step 2: Make a second collage with painted papers on top of the text collage. This was fun and much faster. I told students to cut papers into shapes and that their shapes didn’t have to resemble the sample shapes I prepared. Everyone cut unique shapes. They didn’t want to copy the Calder image. Some students created a narrative collage related to words in the magazine text. Almost everyone told me they loved the idea of having text as a bottom layer in the collage. Following are student images. Notice every collage is created with the same painted papers. Notice every collage image is unique. In Dee’s image above, notice how her shapes balance well against the text design underneath. Notice one blue square extends beyond the substrate bottom edge. Notice 2 red triangles, 1 red circle, 2 yellow curvilinear line shapes and 2 black thin strips in a “V” shape protruding from the blue square. The shapes are geometric and simple and contrast beautifully with the clean design of text collage. Dee wrote she liked the way fitting the print into the background made her think about space. That was a positive. Negative: Dee prefers working on a large substrate – I gave the class a 7 1/2”x8” art card for the substrate. She doesn’t like working with primary colors. Calder’s mobile image isn’t a natural inspiration for her because she likes softer Impressionist art. Positive: the text is in motion and the painted paper shapes are engaged. I think her collage is bold, clean and well designed. In Louise’s image above, you can try to read the text, but the image is marching on top and is the primary focus. 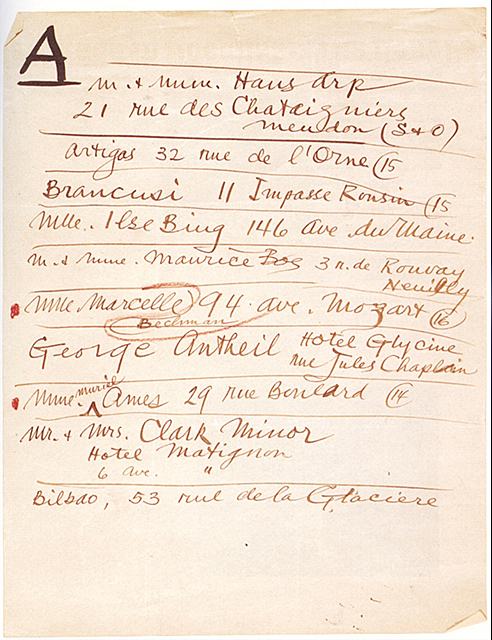 Notice the thin black strip is a criss-cross “X” placed diagonally across the page. Notice the black and white text in the background creates a grid of blocks with white negative spaces. Louise pasted a pale yellow round shape within the “X” and placed a tall red right angle triangle with torn edge on the bottom right side of the substrate. She added more cut and pasted red papers: a tiny square, a tiny circle, one small red equilateral triangle and a thin, curved red paper with personality – all touching the black “X” in the middle. She added a semi circle and a tiny pale blue square touching the red square. She added new papers: 2 irregularly shaped triangles in speckled magazine paper pasted on top of black paper shapes. The painted papers show movement. The text papers show direction. Louise said she liked working with magazine text and thinks she may use it again as a starting point. She says there is no narrative story in her collage. I think her collage has so many interesting components. In Vivienne’s image above, notice the juxtaposition of shapes in text with shapes in painted papers is dynamic and also narrative. I think there’s a story above and beyond the words. Notice how much care she took with selecting text papers for her collage bottom layer. The colors in the magazine text range from dark letters on creamy white, to grey black on light pink white, to blue black on a range of pale grey whites. It’s a beautiful text collage with so much variation in the colors and design. Notice Vivienne created a unique shape in red painted paper. I think it looks like a boat. She has 2 thin black strips projecting up from the red shape on the right side, and one thin blue strip projecting from the red shape on the left side. She has a yellow strip at the end and a yellow triangle on the right. There are 3 overlapping triangles – yellow, blue and yellow – that move down onto the red shape like sails. There is a wonderful sense of harmony and gentle rhythm in this collage. In Claudia’s image above, notice she included text in different sizes and fonts. The text strip “IF YOU LOOK” is prominent in the upper right side. Claudia overlapped her text papers. You can’t read text easily (rows are crunched) and it makes you look more carefully. Notice Claudia created a “V” design with jagged black strips. 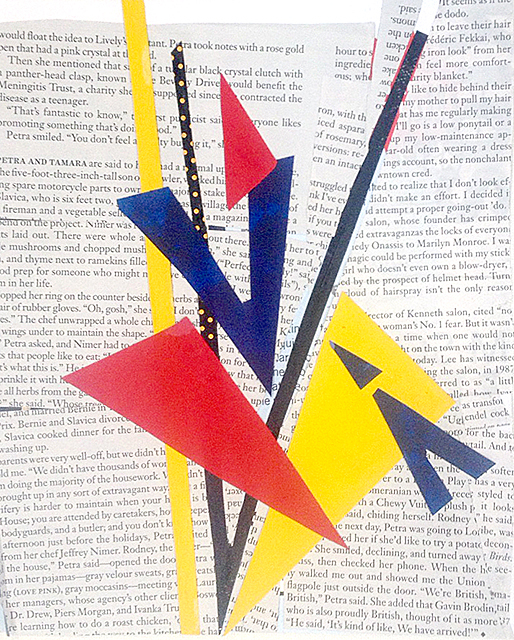 Notice the left side of the “V” touches a color block that is yellow, red and, blue – one paper on top of another. In the lower third of her collage, notice there is a horizontal black and white band across the entire width of the collage and it overlaps 3 red triangles that look like sails. Another blue on yellow shape (mostly yellow) sits below. 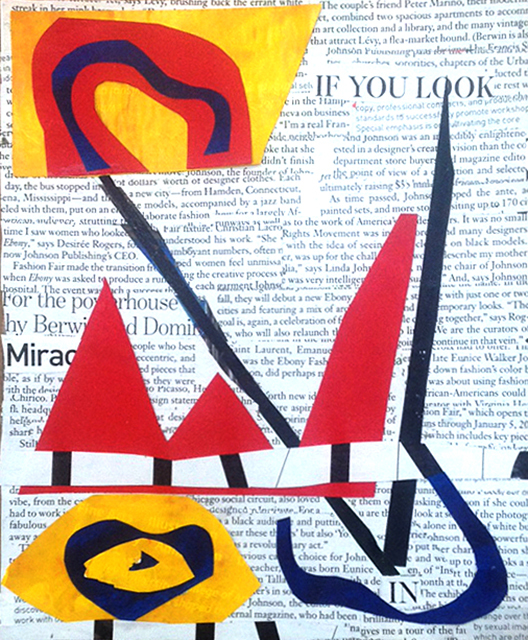 The text ‘IF YOU LO0K” tells you to look “IN.” This collage is very layered, very colorful, and very well designed. In Sheila’s collage above, notice she kept the Mondrian “Boogie Woogie” image that was printed on the art card beneath. Her text strips are glued around the Mondrian image and go to the edge of the card substrate. Her cut and pasted paper shapes go beyond the substrate edges. Sheila said the Mondrian image on the art card influenced her colors – so the project with painted papers in red, yellow, blue and black was a good fit. Notice some shapes overlap; some shapes nest between shapes. 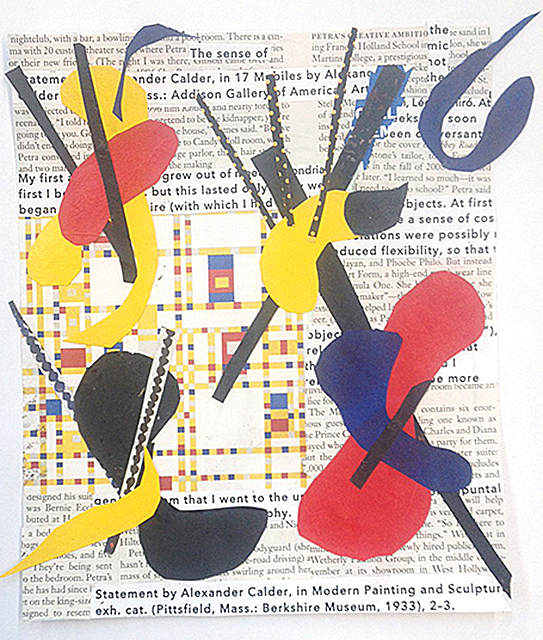 Sheila titled her collage “Joyful Explosion.” Notice you can read the text – it’s about Alexander Calder and his mobiles. This is another well-designed collage. Its abstract and about modern art. 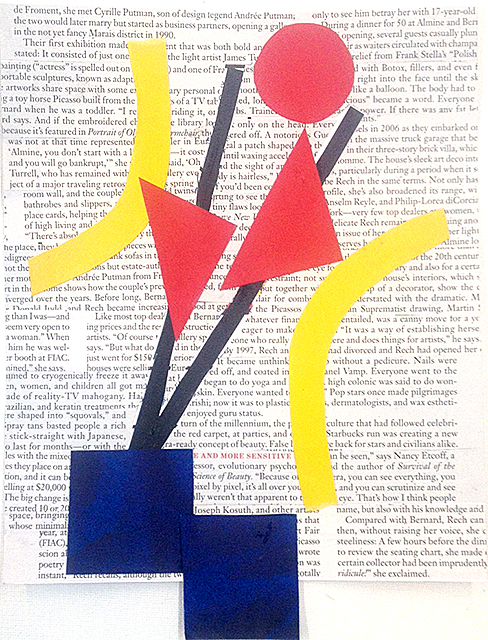 There’s a strong relationship between the text blocks and paper collage shapes, and a gentle connection to the boogie woogie rhythm implied in Mondrian’s work. 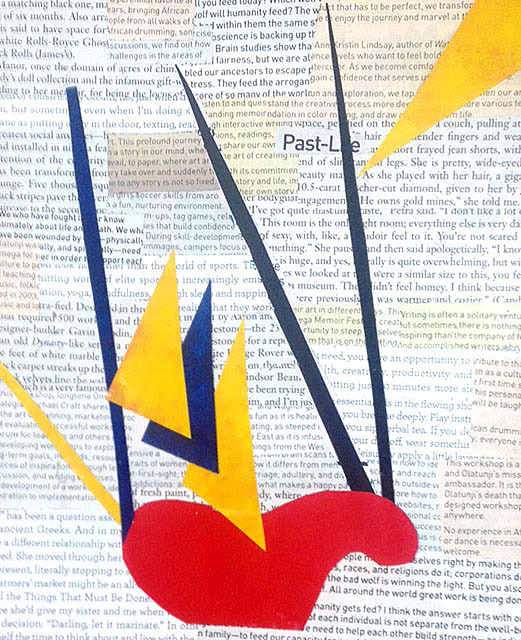 In Irene’s collage above, notice that the pattern of painted paper shapes mimics the pattern of pasted text shapes. All the text is slightly oblique and tilted like the paper shapes in red, blue, yellow and black. I love the fact that Irene left part of the top section of the substrate uncovered to create a horizontal white shape. Did you notice there’s a tiny section of text at the top that’s upside down? Notice that red peeks through the black strip (the right sideof the “V”), I asked the class to leave a tiny space next to the black strip. Irene’s paper shapes are bold and geometric. She cuts into her blue triangles and creates “V” shapes that repeat the “V” of the black strips and the “V” of the yellow strip and yellow triangle. There’s overlapping and repetitive shapes that move in unison along the “V” line. There is a subtle dialog between the upper and lower collage that keeps moving and keeps you looking. In Carol’s collage above, notice how she created text in overlapping blocks and layered painted papers that became a flying bug on top. The “V” of the bug’s antenna covers the “R” in the word “Creature Comfort.” Carol commented: I decided to do some sort of insect when I saw the black “V” shaped pieces that were to be placed on the first collage text layer. She added: Calder made a critter in primary colors so that clinched it for me. I struggled with the background, not realizing how the image and the text would be having a dialog. I found some clever headlines that made the image humorous. The insect itself dominates the lower left portion and though the bug is moving downward there is a feeling of flight. The creature has an oval yellow head with a large black dot for the eye. Notice the body is blue and the wings are red. There is a tail with a fringe on the back in blue and a fringe in blue underneath the head. Two black skinny legs are showing. Carol said: this project was a delightful revelation to me, and I think I’ll do more collage with text and image from now on. Every color and shape emphasizes directional pattern. There is a strong sense of harmony between the lower and upper collage. They talk to each other. I wonder if there is a pun intended in the text “Altitude Slickness.” Where did the “L” is slickness come from? Read my earlier blog (make it good, July 5, 2014) – with links to Seth Godin’s post about challenges “Is better possible?”. I walked into the last gallery at the Whitney Museum by mistake. I was there to see the Yayoi Kusama exhibition. So I saw the last works first – large flat acrylic polymer paintings in flourescent colors – instead of the early small, intimate collages. 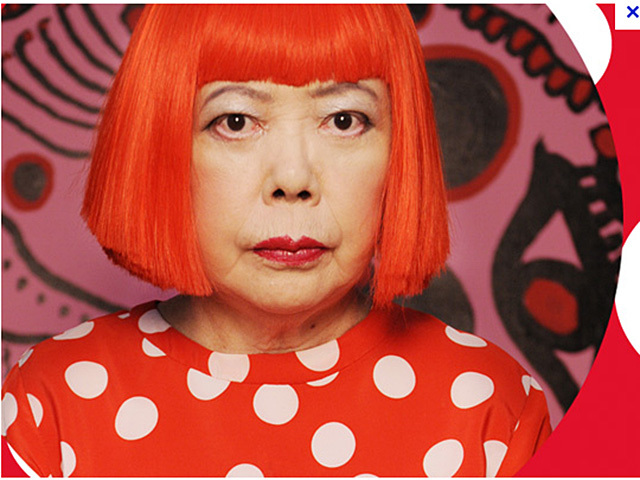 Yayoi Kusama is well known for her use of dense patterns of polka dots and nets. She is known for her work in various media, including painting, drawing, sculpture, film, performance and immersive installation. 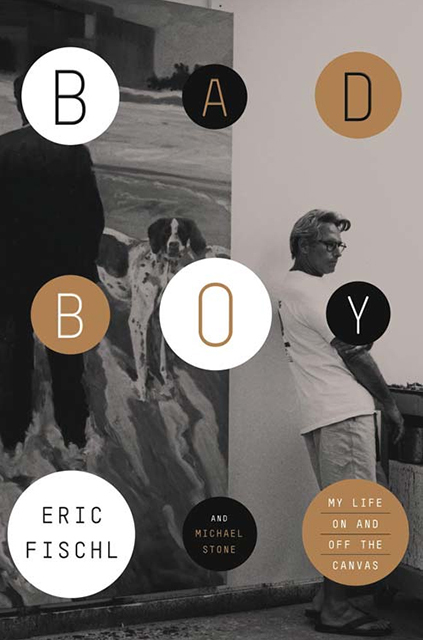 The image above, seen at the Whitney Museum of American Art, is synthetic polymer on canvas, 51×52 inches. Image, courtesy the Internet. Many of her early works were installation, performance, and ephemeral. Many disappeared. She left the United States and returned to Japan in the early 1970s. 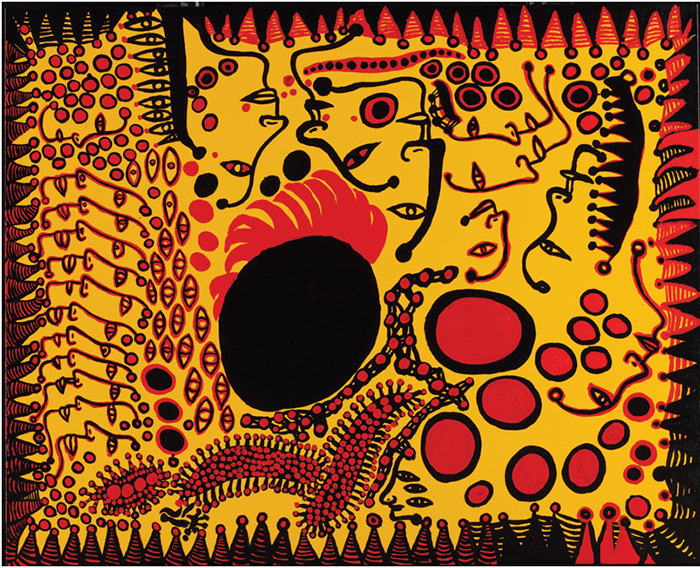 Kusama is now acknowledged as one of the most important artists alive in Japan today. My first impression of the dense painting installation was: Too many. Too busy. Too close – OVERLOAD. The image above, titled Late Night Chat is Filled with Dreams, was in the first gallery I entered with all the recent paintings. 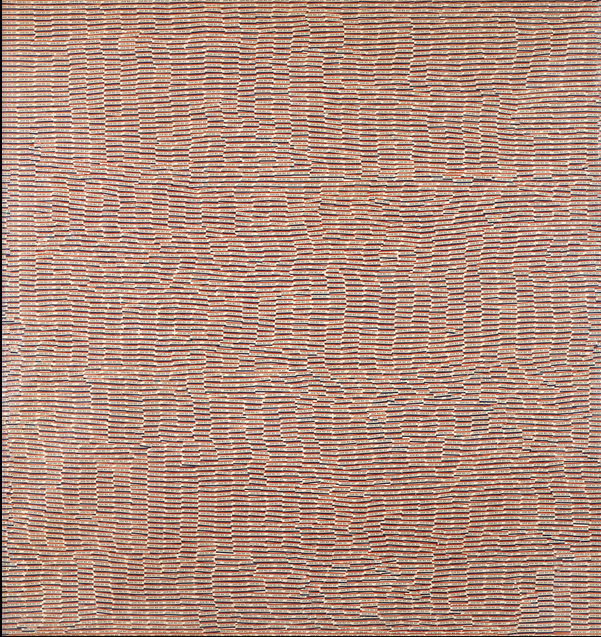 It’s synthetic polymer on canvas, 64×64 inches and was completed in 2009. Image courtesy the Internet. The artist said she would like to finish 2000 paintings before she dies. This painting was about number 196. 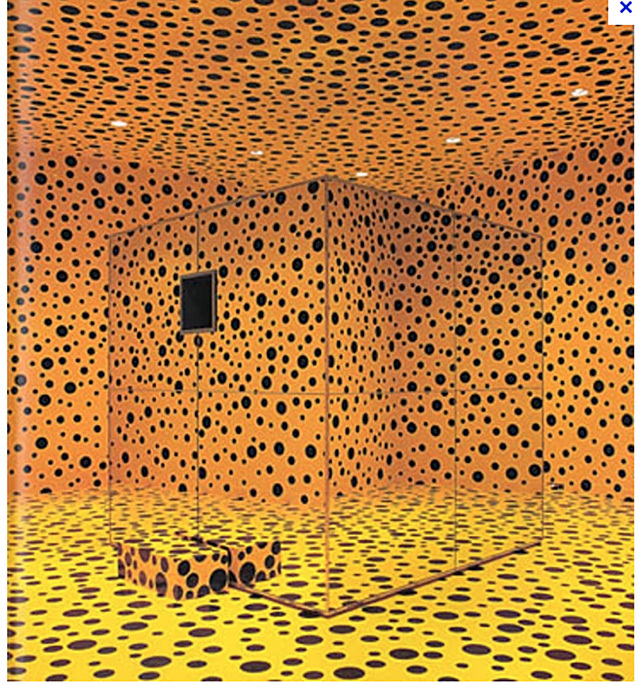 The image above, titled Mirror Room-Pumpkin is an installation Kusama completed in 1991. It is made with mirrors wood and paint to create a dizzying effect. Kusama wanted the dots to appear to go on and on into infinity. The room is orange, like a pumpkin. It’s 69x69x69 inches. 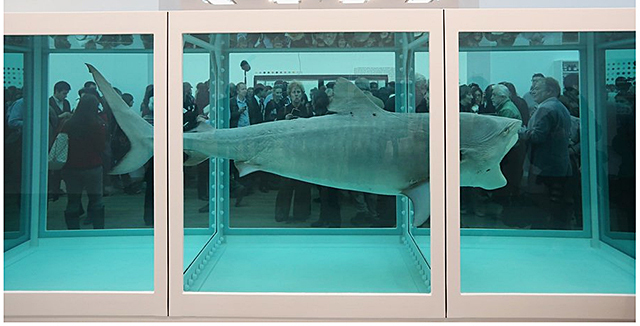 The work is now part of the permanent collection of the Hara Museum in Tokyo, Japan. 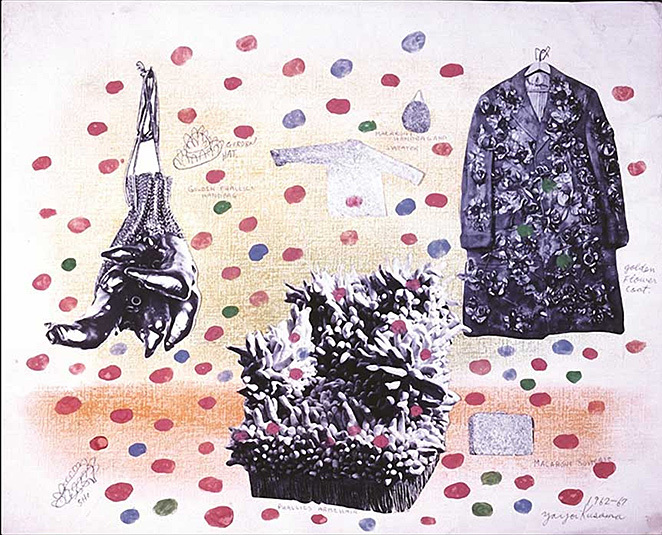 Kusama was the featured artist for the Japanese Pavilion at the 1993 Venice Bienniale. She produced a mirror room filled with pumpkin sculptures. 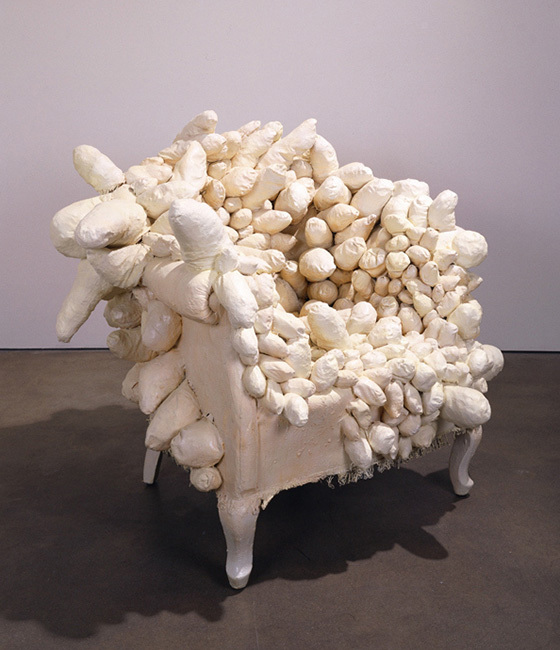 I walked through the galleries and saw a variety of different media, including an exploding chair sculpture (see below). The sculpture communicated a visceral, phallic, raw energy. It was soft and also sly. I liked it. It made me uneasy. It made me think of soft sculptures by Louise Bourgeois. Naughty. Continuing through the galleries, I saw psychedelic dotty installations. 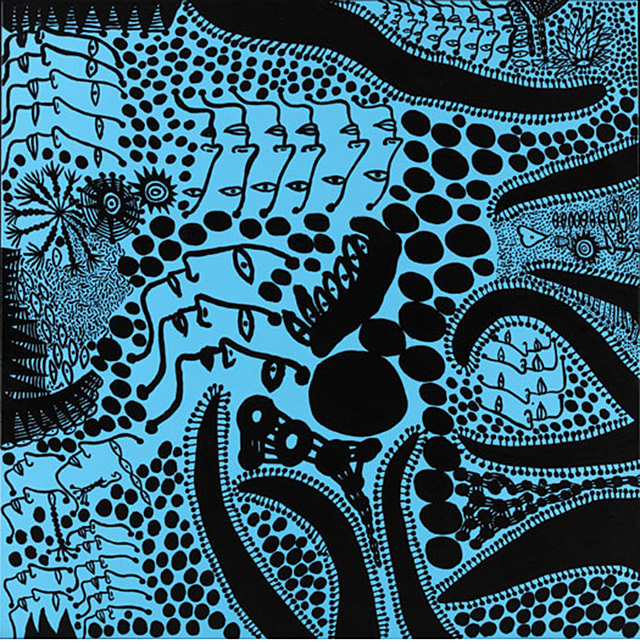 Kusama’s work is about dots. The image above is titled Air Mail Stickers (1962). 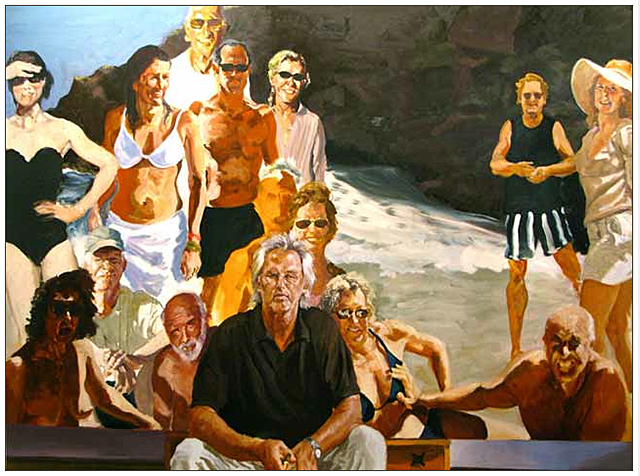 It’s a large collage on canvas, 71×67 inches, in the collection of the Whitney Museum of American Art. The entire surface of the canvas is covered with hundreds of air mail stickers. Kusama had to lick each sticker to get it to stick to the canvas. When the collage was created, stamps were not self-adhesive like today. 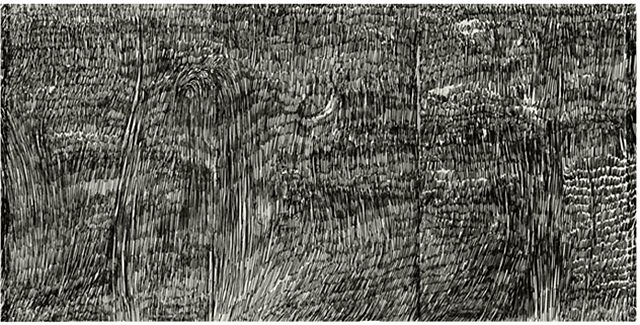 This work is included in the current exhibition. Photo courtesy the Internet. Continuing on to the early works, I saw paintings, photo collage and collage. Everything was getting smaller and more intimate. The collages and photo collages were really wonderful. The image below is a small collage, titled Self Obliteration. There were many other collages and photo collages. Each one was a unique work, and was more narrative and less abstract that the later works. I didn’t get to see the installation Fireflies on the Water on the first level at the Whitney Museum (I was too late to get a ticket into the space). Fireflies (owned by the Whitney and included in the 2004 Whitney Biennial) uses water and mirrors to reflect 150 tiny hanging lights. Only one person is admitted into the installation at a time. The exhibition will continue through September 30, 2012. I titled this blog Collage Exploded. That was a reaction I had when I saw the exhibition. Collage is about putting lots of things together and that’s the experience I got when I walked though the galleries. The exhibition was a collage. Probably because the artist worked in so many different media and everything is included.